Nokia Belle to replace Symbian Belle - End of Symbian OS? It seems that the End of Symbian Operating System is near and Nokia is trying to packing up its homemade Symbian OS and finishing it off with new brand name Nokia itself. Nokia today has just announced that they are soon going to release a new brand name for Symbian Belle and will replace it with the new name Nokia Belle, it has been observed this whole year after Nokia and Microsoft partnership for Windows Phone that both companies are trying to focus more on Windows Phone Smartphone devices so may be Nokia is trying to cut off the brand Symbian from its recommended list. In Nokia's today announcement, company said that they are going to replace old Symbian Belle UI with the new Nokia Belle UI, the company took survey this year about the new interface of Nokia Belle and people actually likes the new Belle interface that’s the reason company has decided to introduced Nokia Belle in all of its Smartphones include Nokia 701, Nokia 700 and Nokia 603 smartphones and will be pre-installed on the new and enhanced versions of the Nokia N8, Nokia C7 and Nokia C6-01 smartphones. Nokia further said that the enhanced versions of Nokia N8, Nokia C7 and Nokia C6-01 have now started their journey from the factories to the shops with Nokia Belle preinstalled, arriving first in China, then around the world. 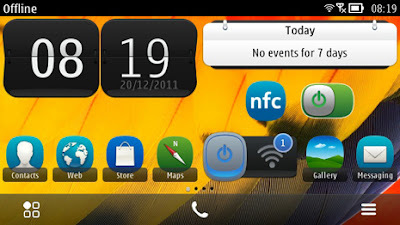 For those People who already owned the Nokia N8, Nokia E7, Nokia E6, Nokia X7, Nokia C6-01, Nokia C7, and Nokia Oro smartphones will get a free over the air software update that will update their phones with the new Nokia Belle UI bringing a whole heap of improved features in February 2012. What you guys think about this new effort from Nokia? Is it the end of an Symbian era for the name of Nokia's home grown operating system which has been the basis for many of its smartphones. Nokia is still working with Microsoft with developing smartphones based on the Windows Phone operating system. Indeed, we can expect some big announcements from Nokia and Microsoft when CES 2012 is held in January 2012. Click here to know more details, features, facts and get pictures about new Nokia Belle.